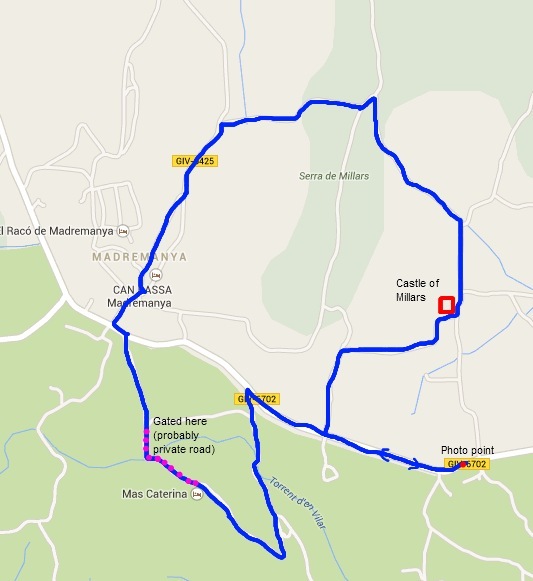 When driving to Madremanya from Monells we've noticed the grand castle at Millars but not stopped. 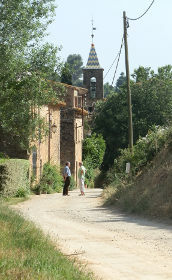 So as the temperatures are rising and Summer's here, we made a short walk from the village of Madremanya - with its honeyed stone with small streets and lanes with gates and archways - out and around and through the castle hamlet of Millars. We were also surprised to find a number of English residents outside their houses on the walk. We start in Madremanya but didn't go and visit the inner parts of the village this time around (see Madremanya to Els Angels walk for more pictures) as we were looking for a shortish walk. Instead we started around the eastern fringes of Madremanya, north into the countryside. Surprisingly we found ourselves walking on a well-kept tarmac road - surprising because the road doesn't particular connect to anywhere north of Madremanya and our experience of country type walks is that they quickly become gravel tracks. The road continues through the fields, now golden with wheat and barley but still dotted with poppies in the summer sun, before turning to the right up and over a hill to Madremanya. We're still surprised to be on tarmac, since this piece of road definitely only goes to the hamlet and castle at Millars (may be the castle owner was mayor once...?). From the top of the hill we have the first views to the castle complex and the nest of supporting houses just outside. In the distance the countryside rolls away towards La Bisbal and the Gavarres hills. Finally, the well appointed road turns to a track and down towards the castle hamlet. 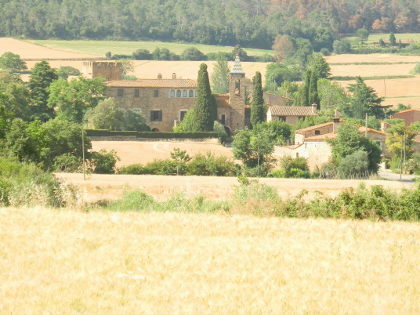 Across the fields are a number of large well-restored masia farmhouses. The track returns to tarmac and we walk along the main 'street' - a line of old stone houses that must have been the quarters for the individuals supporting the castle. We also have English voices as people are chatting outside enjoying the sun and the flashes of colour from the gardens on the opposite side of the road to the houses. From close up, we can't see too much of the castle, but we pass the main gate. If the post boxes are anything to go by it seems the castle is now divided into several private houses so there is no opportunity to see more than peering through the gate posts. It's a little bit of a pity because the view of the castle from the main road is so impressive. We have a choice now of either continuing on the road and then more road, or following one of the marked 'health' paths - small yellow signs that mark a local route for walking for fitness - around the fields. We take the track to get off the tarmac, but though it's fine to walk, we don't quite get the picture perfect photo of the castle. So when we reach the main road, I double back to find the photo. From our position, we can see that we are above a small valley with a stream below us, but the map doesn't indicate any paths (this doesn't mean there aren't any) and the direct route across the road just seems to lead to a farmyard. So we then have a little bit of a walk along the main road before doubling back down towards where the valley is. We pass a farmhouse nestling into the valley, and then cut up the other side of the valley on a path that's clearly marked on the map. As we come over the side of the valley we can see we're entering an area of a masia with some well appointed stables from the back. We'd not seen any signs so we kept going. The stables are actually an equestrian centre (there's lots and lots of horse-riding on the Costa Brava) and as we pass the main house we meet the owner, who turns out to be English too. I think she's a little surprised to see us as she directs us along the road to the gate. The whole area seems to be a very pleasant riding and horse centre with holiday accommodation for guests, but I think private for walking - it just happened we came through the back (this happens from time to time) - as indicated by the definitely closed gate we have to pass through. However, from here it's just a brief walk back to Madremanya. With more time, we'd have taken a drink in the village which is delightful, but not this time.